This coming Wednesday, the cross on the left will be given to Benedict XVI as a gift from Rome's community of artisans.... Notice the coat of arms at the center of the chain. Notice further that that is not a tiara surmounting the coat of arms at the center of the chain. It'd be nice if he wore this new one every once in awhile, no? Since his ascent, Ratzinger has made daily use of a plain, long gold pectoral with a filigreed pattern at the edges of the arms. For choral dress, he's brought out the emeralds. ". . . 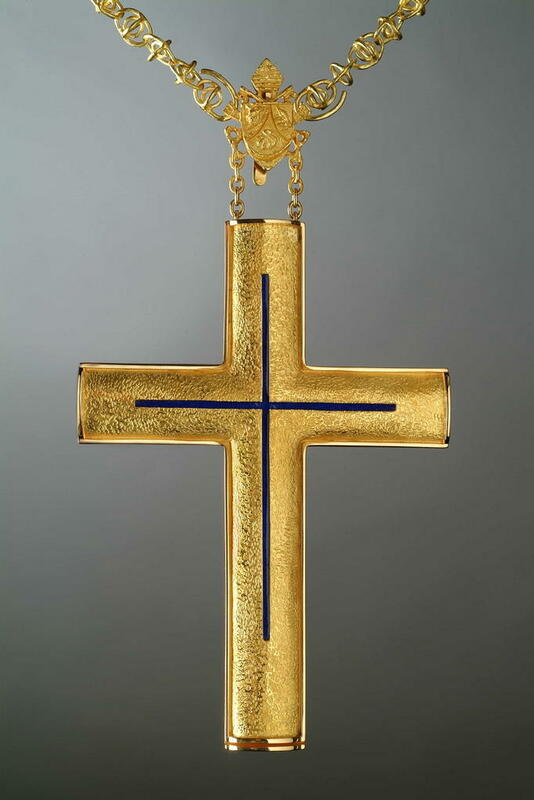 I prepared myself for the project of the Pectoral Cross, seeking to express in it both my own language, as an artistic goldsmith, which communicates through its own medium, as well as the spirituality so incisive a sign wants to and must transmit. 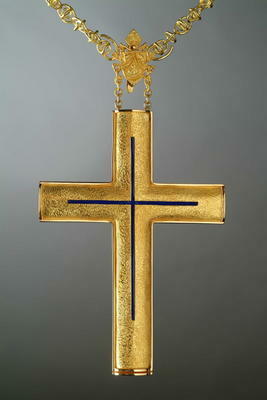 The simplicity and confines (rigor) of the form, appropriate for exalting the strength of the message, are communicated through the ‘texture’ of the surface, obtained through a detailed work of chiseling, and from the blue that leaps out from the very plain style, lightly projecting from the cross, forming a second sign of the cross (a cross within a cross) . . ."
Hey, the Big Man's already gone for modern vestments, what's a streamlined pontifical or two? SVILUPPO: A sterling sacerdote has sent me photos proving that, indeed, the Sapieha replica cross was not John Paul's sole cross for the whole of his pontificate. Early on, he experimented with jewels, and toward the end, he donned a cross which looks conspicuously like the one used daily by B16. Thank heaven there's no tiara! I mean, we all know the Holy Father is a better shepherd and teacher now that that symbol of Satan, the triregno, has been banished. It's quite amazing how all the previous pontiffs who used the tiara in their coats of arms -- gasp, some even wore a real tiara! -- were able to proclaim the Gospel effectively. Rocco, thank you for posting this. Now I can sleep easy knowing the deposit of faith is safe now that the tiara is gone. "The tiaras remain, in truth, an expression of a sensibility bound to a particular historical period, to a culture now surpassed, but it is also a testimony that the Church in the course of centuries has welcomed in itself the signs and proper expressions of diverse cultures to communicate among men a message of faith. The objects of the past, like the tiaras, must be considered with respect as expressions of diverse cultural moments, but also as a stimulus for the purification of the signs used in the Christian cult, in the best adapted way to communicate a message of faith to modern man." Sorry, I fall on the purification and substance side of things. Luckily for me, so does the Pope. ...For these pieces of elegant and perceptive reportage on the pope's latest use and display of symbolism rooted deeply in ancient Catholic tradition. Benedict is greatly gifted in his use of artistry appropriate to a high doctrine of the episcopal office in its proper relationship to surviving papal extremism. It's an adjustment that is long overdue. Thank you for offering us a glimpse of such beauty. Somewhere . . . far away . . . in a tastefully appointed (elegant yet understated) Victorian . . . Marco the Triumphalistic (or, I guess it's Trumph) falls asleep in his four-poster bed (drapes in the appropriate liturgical colour), after having watched THE SHOES of the FISHERMAN one more time. "Good night, sweet prince," he murmurs, "VIVA IL PAPA! Long live Pope Kiril I" . . . .
flights of angels sing thee to thy rest . . .
Actually, it was The Godfather, Part II that lulled me to sleep. "Keep your friends close, and your enemies closer." Wasn't that John Paul I's motto? Love the picture. 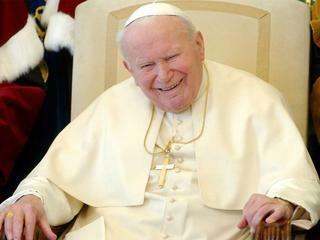 John Paul seems to be saying, "I'm Pope, and you're not, ha ha." Ahhh, our projections. What would life be without them?...Simpler, that's for sure. Despite the very warm and elderly and well photographed countenance of JPII here, we don't have the finest clarity of detail on his pectoral cross. However, I am certain the cross pictured is not the plain gold latin pectoral cross with figured ends currently worn daily by B16. It is quite a bit smaller than that worn by B16. The cross shown here on the breast of JPII, is the Sapeiha/Macharski duplicate decribed by Rocco. It is actually composed of finely crafted, molded and incised lines or ridges that meet in the center of the cross forming a small 'x'. It's very beautiful, subtle design similar in effect at a distance to the larger one worn by B16. I have seen no further information on the current B16 cross. Rocco? Anyone else know?